Acupuncture is the insertion of “thread-like” needles along energy pathways in the body. Treatments are relaxing, effective, and painless thanks to modern technology. This modality of Traditional Chinese Medicine dates back over 3000 years, and is the fastest growing alternative modality in North America.The traditional explanation for acupuncture’s effectiveness is that it modifies the flow of energy (known as qi) throughout the body. Research demonstrated that the effects of Acupuncture needling include influencing the activity of adenosine, an amino acid which becomes active in the skin after an injury to ease pain. This may explain in part why pain relief is often experienced as one of the benefits of Acupuncture. In fact, much research in the West has focused on this pain-relieving effect, rather than Acupuncture’s traditional role of balancing energy to address a wide range of disorders, and the more subtle mechanisms that may be responsible for its overall benefits to health. There are many myths and misconceptions about Acupuncture, especially surrounding what it actually is and how it can help you. Acupuncture is a simple, safe and effective health care technique that helps promote the body’s ability to heal itself. Acupuncture was popularized in the States during the early 70’s after President Nixon opened relations with China. At the time, a New York Times reporter, James Reston, had an appendectomy in a Chinese hospital using acupuncture as a means to decrease his post-surgical pain. However it has been used in Europe since the 1800s, brought to France from Vietnam. Because the goal of acupuncture is to promote and restore the balance of energy, which flows throughout the body, the benefits of acupuncture can extend to a wide variety of conditions, from emotional disorders (anxiety, depression) to digestive complaints (nausea, vomiting, irritable bowel syndrome). It can be beneficial for pain syndromes due to an injury or associated with chronic degenerative diseases such as rheumatoid arthritis. It can also be helpful in treating neurological problems like migraines or Parkinson’s disease, or as a rehabilitation strategy for individuals who suffered a stroke. Respiratory conditions, including sinusitis and asthma have been relieved with acupuncture, as have many gynecologic disorders and infertility. Acupuncture has also proved beneficial for reducing fatigue and addictions, and for promoting overall well-being. AcuCare can treat any symptom with pain-less Acupuncture (and/or other modalities) Using high quality needles, symptoms from A-Z can be treated, even for the most sensitive patient. In Traditional Chinese Medical theory, acupuncture works by restoring balance to the meridian channel system; draining stagnation and blockage in areas where too much Qi is accumulated, and boosting and tonifying areas of insufficient flow. The goal is to have a smooth flow of qi and good reservoirs of blood, yin, and essence. From a scientific perspective there have been tests done where patients had blood taken before and after Acupuncture. What they found is that Acupuncture boosts the immune system (it raises levels of specific hormones, prostaglandins, white blood counts, gamma globulins, and overall anti-body levels). It also stimulates the secretions of endorphins in the body, as well as affects neurotransmitter levels such as serotonin and noradrenalin, thus de-stressing an individual. This is why people feel like they are floating on a cloud after a treatment. It has the effect of constricting or dialating blood vessels. This may be caused by the body’s release of vasodilators, such as histamine, in response to Acupuncture. Acupuncture also closes certain nerve gates by strategically overloading them with impulses, thus reducing pain transmission. How Long Will It Take to See Results? Will I Need Acupuncture Forever? Usually when you first come in for Acupuncture, treatments are done on a weekly basis, usually once, and sometimes twice or three times per week depending on your specific care plan and progression towards healing. Once the condition has been controlled and you are symptom-free, the treatments are done less frequently. Problems that have been around for a long time usually take more treatments to resolve than ones that have appeared more recently. Your treatment course will be determined after the first visit and reassessed after each session. At AcuCare, the focus is to treat the reason behind why the symptoms exist, and not JUST the symptoms. We aim to both relieve pain and support the body’s ability to heal itself. From an acupuncturist’s point of view, there’s no separation between pain relief and healing—pain is reduced because there is healing. The two are inextricably entwined. This is the most common question asked about Chinese acupuncture, since many people associate needles with pain. Acupuncture needles are a similar thickness to a dog’s whisker and are virtually painless when inserted. The practitioner will insert the needle to the appropriate depth. You will then usually feel a very unique sensation that can vary from tingling, to heaviness, to warmth, or even nothing at all. Each person’s experience is different. Should you experience any discomfort, it is important to let us know, so we can adjust the needles accordingly. 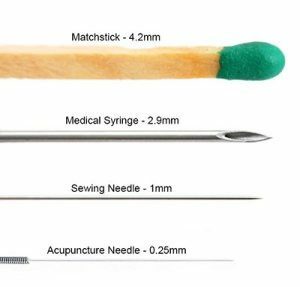 All needles are sterilized and disposable. What should I expect on a visit to AcuCare? Typically, the first acupuncture visit involves a comprehensive health history assessment. You will bring in your consultation form you were emailed, or feel free to download it from the webpage. Questions we might ask may seem strange, but in Traditional Chinese Medicine we need to look at the entire system, including the emotions, to diagnose what the root imbalances are in the system. For example, we may ask to examine your tongue, feel your pulse to help determine energy flow, or ask many questions related to bowel habits and diet, even if these seem to have nothing to do with the primary complaint. After the initial acupuncture consultation and assessment, we will start the treatment. At AcuCare, we believe that education is imperative to the success of the treatment, thus we will explain why we are putting Acupuncture needles where, and why. It is common to experience a deep ache for a short time in some of the points. The depth to which the acupuncture needles are inserted varies according to the treatment and the individual. The pins are usually left in place for five to 20 minutes, usually no longer than 40 minutes, and then removed. Following an acupuncture treatment, we will usually reassess how you are feeling, and often give suggestions for home care. Acute symptoms may require only two to four treatments; whereas for chronic cases, it is common to have as many as 12 or more treatments, usually over a course of eight to 10 weeks. Regular monthly visits are suggested as preventive measures to decrease stress, improve energy or boost immunity. 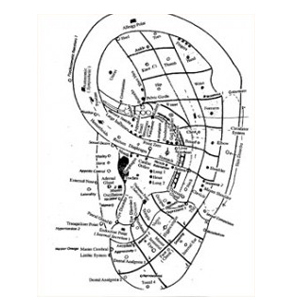 There are as many as two hundred acupuncture points on the outer ear, each point named generally after areas of our anatomy, i.e. knees, hips, shoulders, liver, heart etc. The outer ear acts like a switchboard to the brain. Each acupoint on the ear, when treated, triggers electrical impulses, from the ear, via the brain, to the specific area of the body that is being treated. Therefore if someone had a painful knee, for example, by treating the ‘knee’ acupoint on the ear, it would help alleviate the pain. Auricular seeds may be placed on specific points and retained after patient receives a treatment, and staying in place for up to five days. Common treatments are for drug rehabilitation, stop smoking, and weight loss (used in combination with body acupuncture). This provides electrical stimulation to two to eight acupuncture needles. Can be used for pain relief and muscle pain. Also very effective in increasing circulation for weightloss acupuncture, and excellent for use with drug addictions. Pain and other illnesses stem from the stagnation of circulation in the muscles and body tissues. Cupping improves the circulation in these areas and pain is alleviated and underlying health issues are often helped. Cupping involves applying glass cups to the body. This is done by waving a burning cotton ball, that has been soaked in alcohol, through the cup quickly to create a vacuum. You do not feel the heat, but you will feel the cup pull up on the skin. Once attached, the cups will be left on between 5-10 minutes, and removed by pressing down on the skin to let the air out. They may leave a mark on the body, which could last between 2-12 days depending on the condition. This is a useful diagnostic tool! Depending on how dark the mark is, it indicates how much stagnation there is within the muscles. We use vibrations from precision-calibrated tuning forks that access and travel through the body’s meridian and chakra systems. It uses the same philosophies as acupuncture, but is non-invasive because there are no needles involved. Each fork is tuned to the orbital frequency of a specific celestial body. The vibrating forks are placed on acupuncture points and/or directly on the pain source to treat a wide variety of physical, emotional/psychological, and psycho-spiritual issues. Like adjusting a piano, your body can be tuned to achieve optimal physical balance. Tapping two tuning forks will instantaneously alter your body’s biochemistry and bring your nervous system, muscle tone and organs into harmonic balance. In seconds … your body enters a deep state of relaxation. Feeling centered, your mind will be at peace. If you are interested in the facial renewal benefits sound healing can provide, please click here to go to our ‘facial soundscapes’ specialty treatment page. IMS is an effective treatment for acute and chronic pain of neuropathic origin. It is based on scientific neurophysiological principles. IMS involves the insertion of fine acupuncture type needles into the body where muscles have shortened or contracted. It is problems at these points that are often at the root of long term pain. While a muscle is tight and contracted it can’t heal properly-with IMS you are stimulating a healing process and helping the muscles to relax. IMS treatment is best suited to treat soft tissue pain that shows no obvious sign of ongoing tissue damage or inflammation, such as many forms of: neck/back pain, tennis elbow, frozen shoulder and fibromyalgia, amongst others.